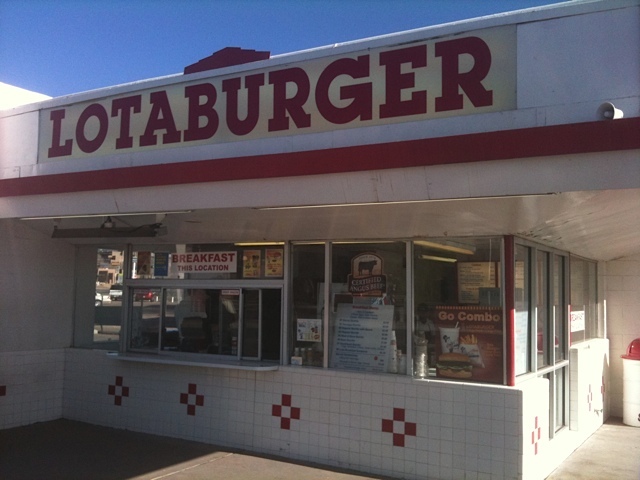 Lotaburger in Santa Fe, the name says it all. I’m two bites into a Blake’s Lotaburger green chile cheeseburger and the experience is heavenly. Opened first in Albuquerque in 1952 by Blake Chanslor, the fast food emporium is a New Mexico institution. For the uninitiated, a green chile cheeseburger is comprised of a beef patty, a slice of American cheese and—in the case of Blake’s—diced Anaheim green chiles (some eateries lay strips of chiles on their burgers). I order mine with yellow mustard, a slice of onion and iceberg lettuce. Prepared when it is ordered it comes piping hot from the walk up window, part of the charm of the 404 North Guadalupe Street store that is six blocks from Santa Fe’s famed plaza. Is there a better burger? I think so. As tasty as it is Blake’s green chile cheeseburger comes in second to the one served at Santa Fe Bite. When your restaurants’ burger is voted “Best Burger in America” by bon appetit magazine you must be doing something right. Formerly known as Bobcat Bite, the original burger joint opened in 1953 and was housed in an old trading post on the Old Las Vegas Highway southeast of town. A dispute with the owner of the building resulted in Bobcat Bite proprietors, John and Bonnie Eckre, opening Santa Fe Bite in 2013. Santa Fe Bite is equally dear to burger aficionados as Blake’s. Proof is evident in the short wait for a table—but it proves well worth it. I just about need to dislocate my jaw to bite into the plump cheeseburger, which is made from primo beef ground daily and grilled to order. Along with diced green chiles, patrons can have their burgers topped with pickles, ketchup and bacon. Side orders of home fries and cole slaw are fine accompaniments to our lunch, although we decide we prefer their traditional French fries. You may wish to leave room for a milkshake or make a return trip. They are tasty. I get a kick watching Guy Fieri, a celeb chef on Food Network television. On his show Diners, Drive-ins and Dives he gives high marks to Bert’s Burger Bowl, another Santa Fe favorite. Having dined here I’m not on the same page with locals who give it kudos (see my ratings below). Fieri dedicated a good portion of one episode to Bert’s prowess for cheeseburgers and he also gives thumbs up to Harry’s Roadhouse, another popular Santa Fe hang out. HR’s is definitely worth a visit. Kim D. McHugh is a Lowell Thomas award-winning writer and member of the Golf Writers Association of America. 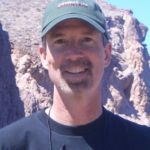 His articles have appeared in SKI, RockyMountainGolf.com, Hemispheres, Colorado Expression, Tastes of Italia, Luxury Golf & Travel, Nicklaus and Colorado AvidGolfer. Agreed. 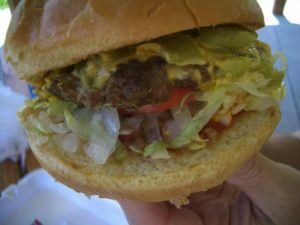 The green chile cheeseburger at the old, character Bobcat Bite was one of my best in western North America (http://marathonmouth.me/2013/05/13/best-burgers-in-the-mountain-west/). I was hoping to try the GCCB at Sparky’s Barbecue in Hatch, NM, but it was closed the day I passed through.